Deputy Prime Minister and Foreign Minister Pham Binh Minh hosted a reception for UK Foreign Office Minister for Asia and the Pacific Mark Field in Hanoi on January 5, where they commended active developments of the Vietnam-UK strategic partnership. 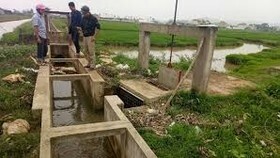 Minh called on the UK Government to encourage British businesses to step up their investment and business in Vietnam, closely coordinate with the Vietnamese side to raise the efficiency of the use of capital sourced from the UK Commonwealth Foundation and create favourable conditions for the country to access the fund. 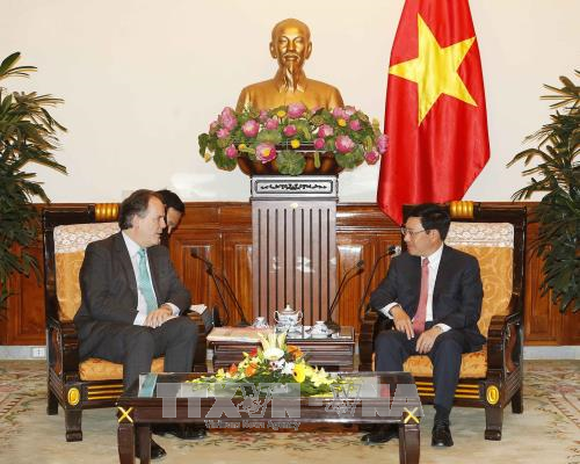 He also suggested the UK Government continue coordination with its Vietnamese counterpart in building a long-term development pathway for the Vietnam-UK Institute for Research and Executive Education and make it easier for the entry and residence of Vietnamese students in the country. For his part, Mark Field highly valued achievements Vietnam has recorded in socio-economic development as well as in international integration in general and trade liberalisation in particular. 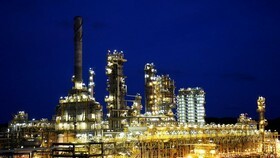 He affirmed that the UK Government will prioritise deepening the strategic partnership across fields in the time ahead. Earlier the same day, Mark Field and Vietnamese Permanent Deputy Foreign Minister Bui Thanh Son co-chaired the sixth Vietnam-UK Strategic Dialogue, which took place in an open atmosphere and on the basis of mutual respect and understanding. The two sides discussed orientations and concrete measures to beef up the strategic partnership in a more practical and effective manner, particularly in politics-diplomacy, trade-investment, education-training, science-technology and national defence-security, in the context that the two countries are celebrating the 45th anniversary of bilateral diplomatic ties (1973-2018). They agreed to increase the exchange of all-level delegations while fruitfully implementing the strategic dialogue mechanism on diplomacy, national defence and security. At the same time, they will increase the promotion of trade, investment, culture and tourism, and people-to-people exchange, along with intensifying their cooperation in international forums such as the UN, the Asia-Europe Meeting (ASEM) and within the framework of the ASEAN-EU cooperation. 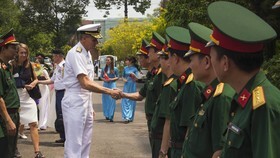 Both sides stressed that economic cooperation will continue being a key pillar of the Vietnam-UK strategic partnership. 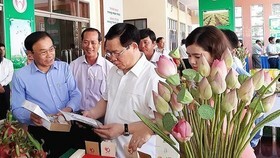 Son affirmed that the Vietnamese Government will continue creating favourable conditions for UK enterprises to do effective business in the country in the fields of infrastructure development, finance-banking, insurance, oil and gas, energy and pharmacy. The two sides agreed to foster cooperation to ensure the continuity of key cooperative fields, especially trade and investment, after Brexit. 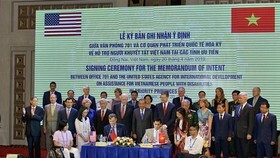 The two countries will also boost connection in vocational training to develop high-quality human resources for Vietnam as well as effectively implement activities of the Vietnam-UK Institute for Research and Executive Education in Da Nang University and scientific research projects in the framework of the Newton Programme Vietnam funded by the UK Government. Regarding defence cooperation, Mark Field praised the fruitful relations between the two countries’ Defence Ministries, reaffirming the continued implementation of bilateral cooperation mechanisms and the Defence Cooperation Memorandum of Understanding between the two ministries. 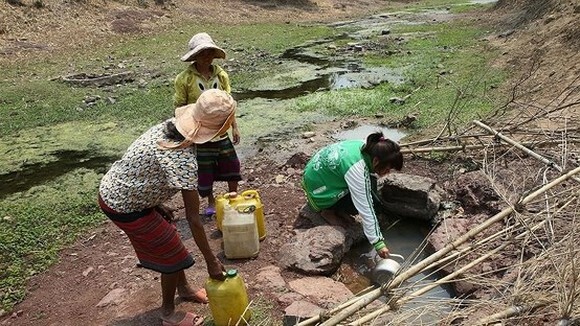 The UK will continue supporting Vietnam in joining UN peace-keeping activities, he said. 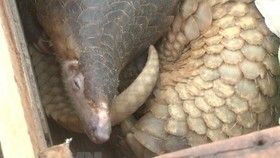 The two sides reaffirmed their commitment to closely coordinating in fighting organised crimes, human trafficking, illegal migration, and illegal trade of wildlife. In the framework of the dialogue, the two officials compared notes on regional and international issues of common concern, agreeing on the importance of improving the efficiency of global administration as well as regional linkages, and the role of international law in resolving global issues. Concerning the East Sea issue, they called on involved parties to show their goodwill in implementing international obligations, avoid activities that can complicate the situation and increase tension in the region. They also stressed the increasingly important role played by ASEAN in maintaining peace and stability in the region, reiterating that disputes must be solved by peaceful measures in line with international law, including the 1982 UN Convention on the Law of the Sea (1982 UNCLOS). The two sides also issued a joint press release on the outcomes of the dialogue.